I had a glorious day yesterday. It was so glorious that I didn't have time to make this post! So here I am. Yesterday was one of those clear just-right-warm days from start to finish. Now, don't get me wrong, I love where we live. I really do love the cool gray weather. It makes for breathtaking scenery. It also means when the sun comes out to play, life pretty much stops and we too go out and play, if at all possible. I was up early to drop my mate off for his own all day adventure to a major league baseball game in a distant city. I knew I would want to be heading out to paint so I got a few hours in my studio during the early morning. I had a quick lunch and did some much needed yard work. After an early dinner I packed up my plein air painting kit, my driftwood frame and supports and headed to the north end of our beach at the foot of Neahkahnie mountain. In last Sunday's post I mentioned that we were celebrating our anniversary that day. One of the things we did on that wonderful day was to hike to the top of Neahkahnie mountain. 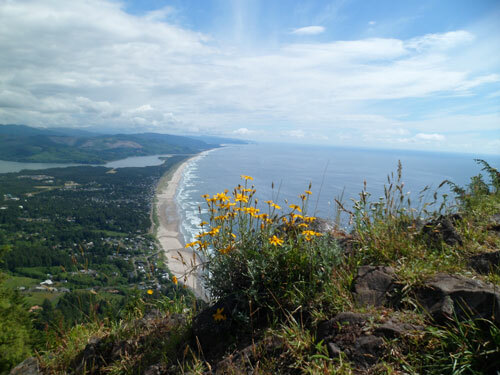 Just for perspective, here is the view from there looking down at our town and south along the Oregon coast. ©2012 R.L. Delight, Just a little place we call home. If you knew what to look for you could see the street we live on! 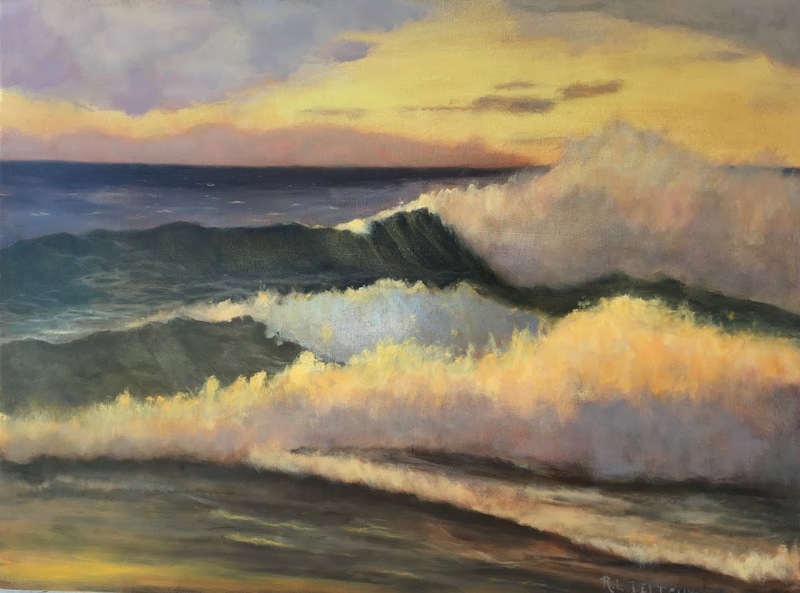 Getting back to yesterday afternoon, I spent the remaining few hours of light on the beach painting an oil study for the next painting I will be starting. Another lovely aspect of living where we do is that it stays light out fairly late during the summer. Of course, on the other side of the solstice, it gets dark pretty early in the winter. I finished up my day feeling productive, happy, and tired. My mate arrived home with the dark and we snuggled in for some well earned rest. I will have some progress pictures to show for my next post. 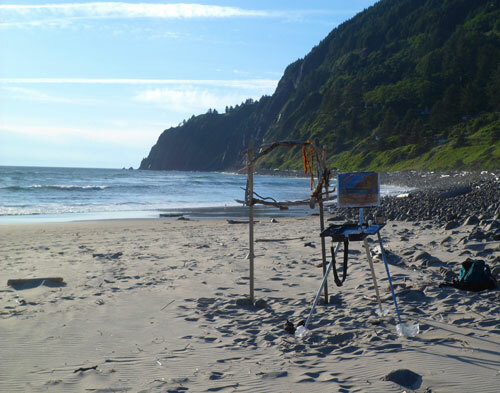 Today I have docent duty at the Cannon Beach Artists Gallery. Before I head up there, I just have enough time to get a little work on my painting in. A perfect sunny day has been hard to find around these parts this year, but glad you got one at least. What a fabulous view BTW. Just breathtaking. Can't wait to see the endeavors of that perfect day.